Ask any blogger – we’ve all been there. That awkward beginner stage where you’re just starting out. You’re consuming every free resource out there to try to learn all that you can about blogging. Some of it makes sense and gives you that aha moment while some of it is weird and techy and might totally go over your heard. I still feel that way sometimes even now that I’m almost two years into it. You’ll often find yourself hanging out in Facebook groups asking tons of questions because you’re eager to learn the ropes. And that’s amazing. You always want to be learning when it comes to blogging. There is constantly something new to learn about and that’s how you grow as a blogger. But sometimes, you don’t want to look like the new kid on the block. Especially when you’re trying to build a brand from scratch and create a glowing audience of loyal fans. I don’t know everything all the time. I’m always picking up new things here and there. But the turning point in my blog is when I stopped coming off as a newbie. When I realized what beginner mistakes I was making and made an effort to correct them, my audience began to grow. So, if you’re planning to be a blogger for the long haul and possibly even turn it into a business, then consider these 9 tips to help beginner bloggers make a killer first impression. One huge thing to get yourself looking like a major pro is getting a domain name! Domain names are really important when it comes to beginner bloggers who want to take on blogging more professionally in the future. A domain name is a name you create for your blog that is most of the time a “.com” name. So for example, my domain name is simply-amanda.com. If you started off on a free WordPress website, you probably have a “websitename.wordpress.com” website. A domain name is a name that you purchase and own so that you don’t need to have that pesky little wordpress.com attached to your name. Coming up with your own domain name is not an easy task. I probably came up with about 10-15 names before I found one that wasn’t already taken. I recommend going for a “.com” website because it’s very memorable and most people just automatically assume your website ends with .com. You definitely want to keep your name short, sweet and to the point. You’ll want it to be easy to remember and don’t forget to make sure that the name you pick is also available on social media! The second tip that is so important for beginner bloggers to turn pro is becoming self-hosted. So what exactly is self-hosting? When you have a self-hosted blog, you basically are paying for your blog to be online. You do not use a free platform and you pay yearly to a web host like Siteground to “house” your website and display it on the Internet. You own your website this way. A self-hosted blog is on its own server and you have full control over it. A lot of beginner bloggers go with free WordPress because it’s so easy and doesn’t cost a dime, but there are many drawbacks that come with a free WordPress website that many bloggers don’t realize when they are first starting out. With free WordPress, you aren’t able to customize your website as much and you are limited in how you can monetize your blog. With these cons, it will be a bit tougher to look like a pro in the blogging world. To read up more about self-hosting and why it’s such a great idea for people wanting to pursue blogging professionally, check out this blog post all about it! It is a bit of an investment since most blog hosts have you pay annually rather than monthly, but it is a really amazing investment. I don’t regret it one bit and I already made back my invest (and some!) within the same year as purchasing my hosting plan. 3. Your profile picture, bio, and about page. People like to know who’s blog they are visiting. They want to see a name and face behind the website. One of the best things you can do is put a nice profile picture with a short and sweet bio about yourself and then create a full About page for your blog. Many beginner bloggers overlook this part. When I first started blogging, I was actually terrified of showing my face and being public about who I was and there are so many beginner bloggers out there in the same boat. Don’t be afraid to be yourself and show who you are. People want to know who is the writer, they usually don’t want to follow anonymous blogs. Be confident in yourself and display a nice picture that shows who you are. Now when I’m talking a nice profile picture, I mean nice. Don’t put up a selfie with the insta dog filter or a really old, poor-quality photo of yourself. If you want to be seen as professional, then see if someone can take a good headshot for you for your blog. It doesn’t even need to be fancy. Just a good photo that’s not heavily filtered or grainy and clearly shows your face. Use your trusty iPhone to get the job done and you should be fine. Then, add a few quick sentences about yourself and your blog under your profile picture. These few lines are part of that first impression you make when someone first lands on your blog. Be friendly and concise in your bio. No need for a million details or a super long bio – leave that for your About page. And make it relevant to what you do and who you serve. Don’t be afraid to add humor and show your personality in your bio. You’d be surprised how great of an impression you make if you’re relatable and funny! Some of the best and most successful bloggers add a little sass into their bios and make the experience really fun. Lastly, an About page is super important. What if someone likes your bio and wants to know more about you? I know I do this all the time. I love reading About pages on blogs. It helps me get to know people even better when I’m on their website. It helps people get to know you for who you are, what you have to offer, and it should show them why they should follow along or subscribe. Infusing your personality into your blog is huge. So, don’t be scared to be yourself! It’s important to pick out a good theme for your website. Something that is easy to navigate and helps visitors find what they are looking for. You can opt to get a premium theme for your blog if you’d like. There are many low-cost themes out there to choose from or you can get a free theme. If you’re getting a free theme, I recommend editing it to match your branding and colors. I started my blog with a free WordPress theme and edited it as much as I could. I didn’t want my theme to look exactly the same and everyone else who had the same one. Shortly after, I purchased my first theme from Etsy and it wasn’t even all that expensive. There are themes out there for every budget. My current theme is from Bluchic and I am absolutely over the moon with it! Bluchic offers so many themes for bloggers, female business owners, service-based businesses, you name it. They are so easy to install and super easy to edit to your liking. Some other great places to check out for premium WordPress themes are Creative Market and Etsy. A lot of these themes are really beautiful and professional looking. The premium ones often have features that free ones don’t. It’s up to you which kind you want to get. I use a premium theme on my blog and ever since I went premium, I’m never going back! The customization abilities are absolutely priceless. I don’t think my blog would be where it is today without a premium WordPress theme. Have you ever gone to a website or blog and noticed a little icon next to their name on the top of your internet browser? Some are cute little graphics and some are a simplified version of the brand’s logo. That’s called a favicon. It looks super professional if you have one on your blog. I don’t know how many times I’ve gone to a blog and one of the first things I noticed is that they have the favicon of that automatically comes with their blog host or they don’t even have one at all. Such a tiny little thing can make a big difference. If you think about your favorite bloggers, probably the majority of them have a favicon for their website. If you’re wondering how on earth you can make a favicon and how to add it to your blog, don’t fret! It’s actually not as hard as you think and you don’t need to have major graphic design skills to make one. I made my own and even though I’m a Photoshop fan, you don’t need to use a program like that to make it. Canva is a free graphic design tool that is SO EASY to use. When I say it’s easy, I am literally not exaggerating. It is the perfect tool for beginner bloggers who are not so experienced with design. Let me tell you, my favicon is super simple. It is just the initials of Simply Amanda. It’s just got a pink background and “SA.” It’s nothing crazy. On Canva, you can make something like this. Just select a blank square template to get started and use the many free colors, fonts, and elements to design something for your favicon. Once you’re done designing it, download and save the image. Then, head over to WordPress > Appearance > Customize > Site Identity and you’ll have an option to upload it there. And that’s it! You’ve got yourself a shiny new favicon. If you have no clue how to make your own favicon, you can head over to Etsy and search for some and you’ll be able to purchase one as low as $6! Let me set the scene: you discover a new blog and you’re excited to check it out. You head over to the website and you’re met with blog posts filled with pixelated, blurry, low-quality images. No matter how great your content is, if you have terrible-quality photos — it’s just a major turn off to new visitors on your website. You only have a few seconds to make your first impression so make it great! If you don’t want to look like a newbie, photos are really important to pay attention to and many beginner bloggers don’t even realize this. You might think you need an expensive camera to create amazing photos, but the truth is… you don’t! When I first started out blogging, all my photography was taken on my iPhone 6. Hell, sometimes it still is. And there were all edited on my phone with free apps. It was super easy and they looked great. Even if you don’t have any device to take photos on, you can still use royalty-free stock photography. I love using free stock photos because they are so much better than anything I could take myself. They’re crisp, clean, and leave an amazing first impression… and did I mention they’re free?! My favorite places to grab free stock photos from are UnSplash, Pixabay, and Pexels. If you want to use unique stock photos that are a bit different than what every other blogger out there is using, I recommend checking out the styled stock photo subscription Pixistock! You can get access to thousands of beautiful feminine stock photos for your blog and they will seriously set you apart from the competition. Pixistock is super affordable and if you subscribe to their newsletter, you can grab a free set of stock photos every month! Consistency is key! Show up on social media and make your presence known. If you want to look like a pro, establish yourself online and create a consistent posting schedule for your social media accounts. You do not need to post every single day. You just need to be consistent. If posting every other day works for you, then do it! I know things get tough and you get busy… especially for beginner bloggers who may still be juggling a day job on top of their blogs. But if you’re consistent, your followers will sort of start to expect you to post at certain times and even look forward to your content. No worries, there are tools out there to make this happen. First thing’s first, you’ll want to have an Instagram for Business account so that you can have access to your Analytics. The Analytics page of your account will show you what is the best time for you to post each day of the week. You can see what the Analytics section looks like in the photo above. When you click on the bars (shown in the red circle), it takes you straight to the page! Once you’ve got that and you have an idea of how many times you want to post, sign up for the free scheduling tool Later and automatically set up your Instagram to post for you or send you a notification when it’s time to post! Later is amazing because you can preplan your grid, pre-write your Instagram captions, and save your hashtags… all in one nifty little app. Pretty cool, huh?! And totally free. I always sound like a broken record when I say this… but you NEED an email list. It doesn’t matter how “small” you think you are. Beginner bloggers make this mistake so often and I was not an exception. I made the mistake of ignoring email lists. I was like, who even reads emails anymore anyway? I thought I didn’t have enough readers or enough traffic to create an email list. And beginner bloggers might think the same thing too, but none of that matters. Creating an email list from the start helps you build the audience of your dreams and it keeps your readers in the loop for when new content goes live on your blog. Email lists are awesome because they look super profesh and they help create a sense of community around your blog. They help grow your traffic, grow your social media presence, create an audience of raving fans, and it’ll help you go pro in the long run. And yes, it’s free. You might be thinking — but how? Well, when you create an email list of readers who are totally obsessed with your content, they will trust you enough to buy from you should you ever create your own product or service in the future. You can monetize that list, babe! There’s literally no reason why you shouldn’t have an email list. Yes, it’s an extra task added to your plate but think about it… emails are short and brief. It shouldn’t take you very long to do and you really only need to send an email once a week. There are tons of things you can write about so don’t think it’s too hard to come up with content. You can share your newest blog posts, you can write about your thoughts or things going on in your personal life, and much more! You can take old blog posts and expand on them in your newsletters or just send out inspirational messages to your readers. It’s your choice and your readers will love you for it! #9 on this list is using prettier permalinks. Don’t freak out by the word “permalink.” It may sound like some weird tech term to beginner bloggers, but it’s super simple… I promise! And if your blog post title is long… your URL turns out being way too long! Luckily, there’s an easy fix to make your links more visually pleasing to your readers. Head over to the Settings section of your WordPress account and click Permalinks. Pro tip: Beware of changing permalinks if you already have multiple links out there directing to your old permalinks. This can lead to a BUNCH of 404 errors. 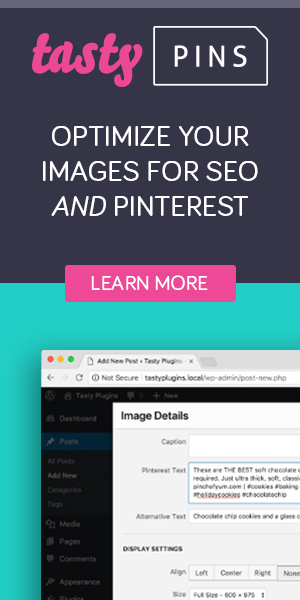 If you have blog posts on Pinterest, make sure to change all the links. You can also use a plugin to redirect all your 404 errors to the correct links. You can also create pretty links for affiliate links and other long links on your website! If you have a link you don’t really like, you can install the plugin Pretty Links to make them look nicer — very much how we changed the links above. Pretty Links is great for links to direct to other websites that you can’t necessarily change yourself in your WordPress settings. The great thing about Pretty Links is that you can also track clicks on the links. So you can use pretty links for anything you want to track to check how popular it is with your readers. Those are the top 9 tips for beginner bloggers that you can implement right now to transform your blog and make yourself look like a pro in the blogging world. Amanda, thank you so much for writing this post. It really spoke to me and gave me inspiration for a few changes I’d like to make to my site to up my game! I am SO glad this post inspired you to take action & make a change. Wishing you the best of luck! Wow, thanks so much for this post, Amanda! I’m still setting my blog up, but this was super helpful – especially the bit about permalinks (I hate those ugly, clunky ones)! I am a total newbie so this was great, quick and straight to the point. Btw – you skipped number 6! I noticed because I was listing all the things I needed to do. Glad you found it helpful, Clare! So Informative yet simple! Thank you! So glad this could help you, Cherie! Yay! Even just one small change or tweak can make a big difference!